Lung cancer is one of the main causes of death on this planet, and by the time symptoms are recognized, it might be too late. In China, lung cancer is the leading cause of cancer-related deaths. A total of 781,000 patients receive the diagnosis each year. But it doesn't have to be a fatal disease if it is detected and managed at an early stage. The problem: many people lack awareness about the causal risk factors, and too few of those people at high risk pursue regular check-ups for early cancer detection. "A lot of elderly Chinese have never done a CT scan in their life," Zhi Xiuyi, director of the Beijing United Family Hospital (BJU) Lung Cancer Center, said during a roundtable discussion hosted by the center on Wednesday, adding that the common misconception that you only need to see the doctor after you develop symptoms was still widespread in China. He named smoking, and indoor and outdoor pollution as the main causes of lung cancer. "For individuals at high risk, low-dose CT scanning performed regularly reduces the risk of dying from lung cancer by 20 percent over five years," professor Richard Epstein, medical director of the United Family New Hope Oncology Center, told Metropolitan. 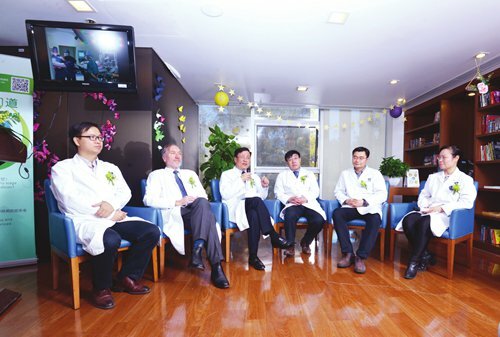 The Australian-born professor, who has spent most of his career setting up new cancer centers around the world, joined BJU in late October with the aim to further develop the New Hope Oncology Center as an international-style private cancer center in China. He recommends screening for early-stage lung cancer for people aged between 55 and 80, who have a history of heavy smoking. Other risk factors include a family history of lung cancer, exposure to asbestos or silica, previous chest radiotherapy, a past history of other smoking-related cancers, and chronic chest infections. Epstein stresses the importance to quit cigarettes as the most important intervention for most people in reducing the risk of dying from lung cancer. "Once you stop smoking, your risk of dying from lung or other smoking-related cancers will immediately start to reduce, no matter your age," he said. For patients whose cancer is more advanced, BJU hopes to pioneer a "one-on-one style of personalized and compassionate oncology care that also offers the latest scientific breakthroughs." Instead of referring patients to one expert, BJU practices a multidisciplinary team approach that can reliably assess the complexity of the molecular biology of the tumor and its sensitivity to different treatments. Epstein, who spent over 25 years of further clinical training and research in leading institutes such as Cambridge and Harvard, said his main interest as a medical oncologist was to see whether patients can benefit from newer targeted "smart" drug therapies or immunotherapies. Targeted medicines work very specifically and are customized to a patient's cancer, whereas immunotherapy has the ability to kill off cancer for a very long time. "We know that these treatments have the potential to improve patient outcomes," he said. "Beijing is now one of the most important cities in the world, so it seems essential that Beijingers can access cancer care which is as good as anywhere in the world."